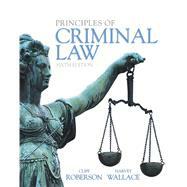 A concise yet comprehensive overview of criminal law, the Sixth Edition of Principles of Criminal Law is an engaging narrative text ideal for a one-semester course. Rather than focusing on dense citations and lengthy discussions, this text has a clear, accessible tone that will help students grasp the material quickly. Covering a variety of topics, such as white-collar crime, victimless crime, and political crime, as well as major offenses like homicide and sexual assault, chapters focus on real-world applications and include short edited cases, focus boxes, and end-of-chapter practicums. This edition includes updated information on changing marijuana laws, “Stand-Your-Ground” laws, terrorism, and more. Cliff Roberson LLM, Ph.D. is an Emeritus Professor of Criminal Justice at Washburn University, Topeka, Kansas and a retired Professor of Criminology at California State University, Fresno, California. He has authored or co-authored over 60 books and texts on legal subjects. His previous academic experiences include Associate Vice-President for Academic Affairs, Arkansas Tech University; Dean of Arts and Sciences, University of Houston, Victoria; Director of Programs, National College of District Attorneys; Professor of Criminology and Director of Justice Center, California State University, Fresno; and Assistant Professor of Criminal Justice, St. Edwards University. Dr. Roberson’s non-academic experience includes U.S. Marine Corps service as an infantry officer, trial and defense counsel and military judge as a marine judge advocate; and Director of the Military Law Branch, U.S. Marine Corps. Other legal employment experiences include Trial Supervisor, Office of State Counsel for Offenders, Texas Board of Criminal Justice and judge pro-tem in the California courts. Cliff is admitted to practice before the U.S. Supreme Court, U.S. Court of Military Appeals, U.S. Tax Court, Federal Courts in California and Texas, Supreme Court of Texas and Supreme Court of California. Educational background includes: Ph.D. in Human Behavior, U.S. International University; L.L.M., in Criminal Law, Criminology, and Psychiatry, George Washington University; J.D. American University; B.A. in Political Science, University of Missouri; and one year of postgraduate study at the University of Virginia School of Law. Harvey Wallace, who died in 2007, was a professor and chair of the criminology department at California State University, Fresno, California. He also served as the academic coordinator for the U.S. Department of Justice, National Victim Assistance Academy in Washington, DC. Professor Wallace had a JD and was the former City Attorney for Fresno, California and County Counsel for Butte County, California. He also served as a deputy district attorney for San Diego County, California. He retired from the U.S. Marine Corps Reserve. He has written and published numerous articles in academic and professional journals and eight textbooks in the social sciences and criminal justice field. He was noted for his work with victims and victim assistance programs. Principles of Criminal Law: 5 out of 5 stars based on 1 user reviews.